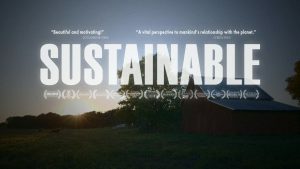 This month at InFARMation, we have on tap an exclusive showing of the new, award-winning film Sustainable. Sustainable is a vital investigation of the economic and environmental instability of America’s food system, from the agricultural issues we face — soil loss, water depletion, climate change, pesticide use — to the community of leaders who are determined to fix it. Sustainable is a film about the land, the people who work it and what must be done to sustain it for future generations. An Overview of Sustainable: There is no hiding from the facts – rising temperatures, drought, soil loss, chemicals in our food, antibiotic resistance, declining bee populations, obesity, diabetes, shorter life expectancy – America needs help. Sustainable reveals the crisis facing America’s food system, and the community of leaders who are determined to fix it. Amidst the cornfields of Illinois lives the hero of the film – Marty Travis, a seventh-generation farmer who watched his land and community fall victim to the pressures of big agribusiness. Determined to create a proud legacy for his son, Marty transforms his profitless wasteland and pioneers the sustainable food movement in Chicago. Greg Wade, a visionary young breadmaker, works with Marty to revitalize ancient grain production in the Midwest, joining an artisan bread movement that’s sweeping our country. Together, they prove that traditional bread is not only healthier, it is also better for the environment. From Klaas Martens’ Einkorn fields in rural New York to Bill Niman’s cattle ranch off the Pacific coast, industry pioneers around the nation join in to reveal the profound connection between human health and environmental protection. In Iowa, Matt Liebman discovers a solution to combat the trifecta of drought, flooding and soil runoff, and a young Amish man in Ohio emerges as an agricultural leader who will feed the world despite climate extremes and limited natural resources. Additional key interviews include Rick Bayless, Dan Barber, Mark Bittman, Marion Nestle, John Ikerd, Kelly Brownell, Nicolette Niman and Fred Kirschenmann. Sustainable is a story of hope and transformation, about passion for the land and a promise that it can be restored to once again sustain us. Matt Wechsler, Director/Cinematographer/Editor, Hourglass Films – Matt is an award-winning filmmaker from Chicago and the founder of Hourglass Films. His 2012 New York Emmy-nominated documentary, Different is the New Normal, aired nationally on PBS and was narrated by Michael J. Fox. In 2014, he shot and edited a 30-minute documentary, I Am For Peace, which also aired on PBS. Sustainable is his first feature film. Annie Speicher, Producer/Editor/Audio, Hourglass Films – Before joining Matt at Hourglass Films in 2013, Annie edited several television shows including Mexico: One Plate at a Time featuring Rick Bayless. She has been nominated for a 2013 Midwest Emmy for her production work on Grannies On Safari: Colors of Cuba, as well as a 2016 Daytime Emmy for Mexico: One Plate at a Time. Sustainable is her first feature documentary.